Starlite Festival Marbella 2019 - All You Need to Know! 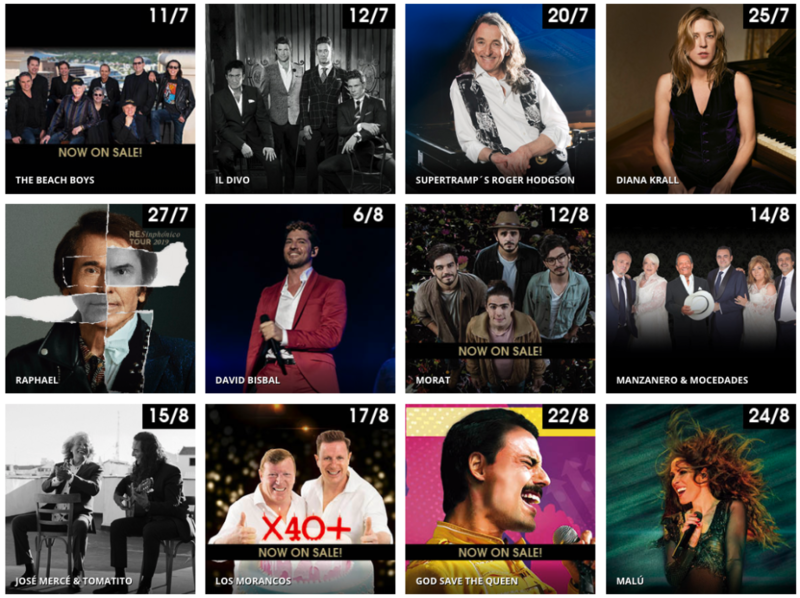 Home Starlite Festival Marbella 2019 – All You Need to Know! Starlite Festival Marbella 2019 – All You Need to Know! Starlite Festival Marbella 2019 is one of the important annual social and entertainment events in Spain that you don’t want to miss! Taking place over the course of several weeks, the festival invites global superstars to perform in the impressive mountainside auditorium. This year the event will be held from July 11th to August 24th 2019 at the Auditorium Marbella (Cantera de Nagüeles). The best International Stars like Julio Iglesias, Lenny Kravitz, Lionel Richie, Ricky Martin, Enrique Iglesias, Alejando Sanz, Tom Jones , Laura Pausini, Andrea Bocelli, Anastacia, Bryan Adams, Luis Miguel, Juanes, Hardwell, Elton John and many others have chosen Starlite to give there concerts with proximity between the stars and the audience. But more important, this event is much more than only concerts it also about Fashion, Art, Cinema Premieres and exclusive parties at Starlite Night. See here an overview of Starlite Marbella 2018! Starlite offers gastronomy, cinema, fashion shows, art exhibition and the most exclusive summer parties that take place every night in Starlite Night. In Starlite stars are not even on the stage, they’re between the public, having dinner, dancing or just enjoying this experience. At Starlite you will find a lot of international celebrities, like actors, singers, musicians, sportspeople, entrepreneurs and politicians or socialites all in this incomparable environment in Marbella. Starlite dedicates one night a year to philanthropy with STARLITE GALA, whose host is the famous Antonio Banderas. Starlite has “Marca España” signature for representing state values and consider it as a huge ambassador of Spain in the world. Starlite is a microuniverse where everything is possible. Starlite Location, Directions and opening hours. The auditorium is located just above the community of Sierra Blanca, just a few minutes drive from the centre of Marbella. You can find the location also here on google maps. By car: Highway A7, Exit 181 (Nagüeles). By bus: Starlite Line from Marbella city. In case you go by car, you can go from centre of Marbella, at Plaza Bocanegra near the Palacio de Congresos (Exhibition Centre), take Avenida Don Jaime de Mora, cross the motorway and turn into Avenida Buchinger, which becomes Avenida Albinoni. Keep going up, following the other cars, and you will find the Starlight signs. General parking: Free to the festival attendees with a shuttle service available. VIP parking: Available to Gold and Silver box tickets with a private chauffer to take visitors to the red carpet. Valet parking: Available to Platinum tickets, visitors can reach the red carpet by car and our staff will park it on their behalf. Starlite opens at 20.00 p.m. every day, just Monday to Saturday. The gastronomy and restaurant area opens at 20.00. The concerts that take place in the auditorium stage begin at 22:00. The Espacio Sessions gigs will begin at 22.30 or 2.30 a.m.
We recommend you to plan ahead and get your tickets on time! Also if you need a Hotel we recommend to book well in advance as July and August are the top tourist months in Marbella. Are you going to Starlite Marbella? Are you going to the event this year, or have you been there before and want to share your experience?